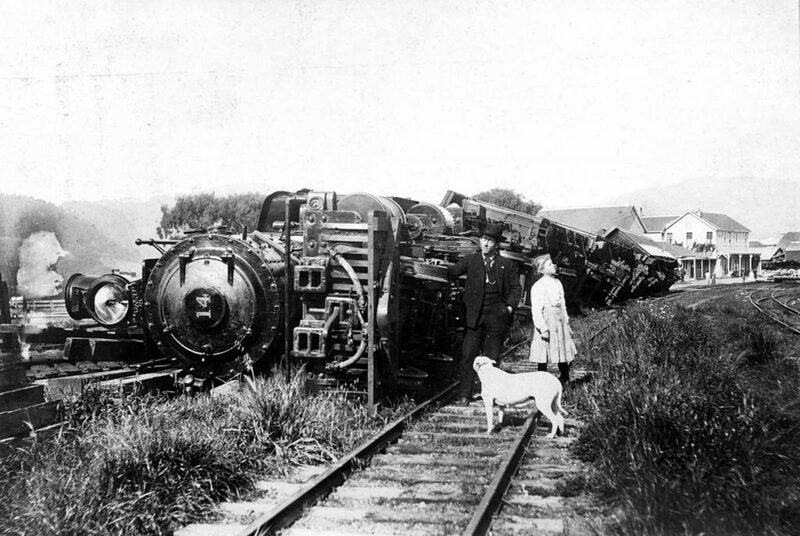 By mathematically modeling the movements of a locomotive that toppled from the tracks north of San Francisco during the city’s infamous 1906 earthquake, researchers have calculated a lower limit on the earthquake ground motion at the spot of the tipped train. Their report in the journal Seismological Research Letters concludes that the ground shaking was equivalent to at least a “severe” level that could overturn heavy furniture, collapse chimneys and cause considerable structural damage. The direction and strength of the ground motions are consistent with simulations of ground shaking for the 1906 earthquake from a 2008 study, said Swetha Veeraraghavan and colleagues. Seismologists rely on these ground motion simulations because the nearest ground motion records of the historical event came from a station located 35 kilometers (21.7 miles) away from the San Andreas Fault, which ruptured during the earthquake. The simulations help scientists determine what sort of ground motion might be likely during future large earthquakes in the region. Data gleaned from the unusual case of the toppled train, said Veeraraghavan, can be used to test the results of high-performance computing simulations of the 1906 quake and possible future quakes. “With the limited availability of ground motion records for large earthquakes, these eyewitness observations become critical data points that lend credibility to these large earthquake simulations,” she said. Veeraraghavan and colleagues used the eyewitness account, a photo of the toppled train taken by the train’s fireman and information about the size and design of the train (approximating it as a rectangular block) to guide their modeling of the ground motions that would have been necessary for the train to fall in the way that it did. From this analysis, the researchers calculated two measures of ground shaking—peak ground acceleration (PGA) and peak ground velocity (PGV)—to determine the minimum ground shaking necessary to overturn the train. Their results for these two measures are equivalent to a score of VIII (severe) on the Modified Mercalli Intensity scale. This isn’t the first time that seismologists have attempted to extract ground motion data from the toppled train. Thomas Heaton of Caltech, one of the co-authors on the current paper, was part of a team that published a similar analysis in the Bulletin of the Seismological Society of America in 1999. The new study improves on these findings by considering potential vertical as well as horizontal ground motions gleaned from 140 worldwide earthquake records in its analysis. The researchers compared the ground motions calculated from their train model to three different simulations of the 1906 earthquake from a 2008 study, concluding that each of those simulated earthquakes could cause severe enough shaking to overturn the train. The eyewitness account of the train lurching east then west before toppling suggests that the hypocenter of the 1906 is likely to be south of Point Reyes, perhaps offshore of San Francisco and San Juan Bautista as others have calculated, the authors write.